Frequently Asked Questions | International Medcom, Inc.
Do your instruments measure x-rays? How often do your instruments need to be calibrated? Do your instruments detect radon? How would I use one for this purpose? Do your instruments measure microwaves? Radiation from cellular phones? Power lines? How would I measure radiation in food? How do you determine the MDA (minimum detectable activity) of beta radiation in a contaminated sample? Our Geiger counters detect x-rays, but may not be accurate in measuring the dose rate. This is because an x-ray is usually a short concentrated burst of radiation. A geiger counter measures by detecting individual ionizing events in its Geiger tube. The events during the X-ray usually occur so fast that the instrument cannot detect all of them, giving a reading that does not reflect the full amount of radiation. For a true dose rate, an ionization chamber would be required. Medical and dental x-ray machines sometimes have “scatter,” or leakage in directions other than the target. Inadequate shielding can cause this scatter to reach personnel, resulting in unnecessary exposure. To screen for scatter, you can place the Radalert® 100X in a location you want to test while the x-ray machine is activated. If there is scatter, if the instrument is in Audio mode, you will hear a rapid burst of chirps, or clicking, and it will produce a higher-than-normal reading. Keep in mind that the reading, while a reliable indicator of scatter, is not an accurate measurement. Some Geiger counters, especially older designs, require regular calibration to ensure that their readings are accurate. Our instruments incorporate innovative modern design techniques and high-quality components. In over 28 years of manufacturing the Radalert®, Radalert® 50, Radalert® 100, Radalert® 100X, the IMI Inspector™, IMI Inspector Alert™ V2 and similar instruments, we have found that they maintain their original calibrations remarkably well. Some facilities require calibration certificates or annual calibration with an NIST-traceable source. Our instruments are calibrated electronically after manufacturing, and an electronic calibration certificate, except for the CRM-100™, are shipped with each order. If you require NIST-traceable calibration, we can provide this for an additional fee at the time of order placement, or we can refer you to our approved repair and calibration laboratory for direct service. If your instrument is for educational or hobby use, you probably do not need to calibrate it on a regular basis, but you may want to check it periodically against a known source of radioactivity to assure yourself that it is working properly. If you use the instrument professionally in an environment that has radioactive materials, you can use a calibrated check source periodically for the same purpose. There are differences of opinion on the suitability of Geiger counters for detecting radon. While it’s true that the Radalert® 50, Radalert® 100, Radalert® 100X, IMI Inspector™, and the IMI Inspector Alert™ do not specifically measure radon gas, experiments with the Radalert® 100X in a controlled environment with different levels of radon gas indicated that the average counts per minute did rise and fall with radon concentrations. The radiation detected is a combination of the emissions from radon and its “daughters” (decay products). The results of the experiments showed an almost linear increase of CPM (counts per minute) in relation to increased radon concentration; from 17 CPM at 0 radon concentration to 33 CPM at a concentration of 65 pCi/l. At 4-5 pCi/l, the increase was 1 CPM. The IMI Inspector™ V2, though it has not been tested with radon, should be more effective, as it has a higher sensitivity to alpha and beta radiation. We do not recommend the Radalert® 50, Radalert® 100, Radalert® 100X, IMI Inspector™, or the IMI Inspector Alert™ V2 as an alternative to EPA-approved carbon canisters or other standard methods of testing for radon. If you want to use the Radalert® 100X or the IMI Inspector Alert™ for experimental, educational, or screening purposes in regards to radon, the following guidelines may be helpful. The most likely entrance points for radon in homes or other buildings are cracks or openings in the floor around pipes or conduit, unsealed wall-floor joints, and underground hollow block walls. Dirt floors in basements are particularly vulnerable. Unventilated basements or closets normally have higher levels of radon than well-ventilated areas. Before you screen for radon, you should establish baseline measurements; for example, determine the background level in a location outdoors three feet above the ground and in a location in a place in the house not likely to have radon accumulation. It is best to accumulate the baseline counts for 12 hours as described below. To screen for radon, place the instrument on the floor near any suspected entrance point. For best results, keep air exchanges between indoors and outdoors at a minimum for 12 hours before and during the test. Set the display to Total and accumulate the counts for 12 hours in each location. Divide the total count for the period by the exact number of minutes to get the average CPM. If the 12-hour average CPM in your home is more than 1 CPM higher than outdoors, you may want to do further testing for radon using carbon canisters or other EPA-approved methods. Another way of screening for radon is by checking the air particulates, or dust. Several radon daughters, which account for much of the radiation produced by radon, are negatively charged and attach themselves to the dust. You can obtain accumulated dust by wiping a television or computer monitor screen with a piece of tissue paper (the CRTs are positively charged and this specifically attracts the negtively-charged particles) or by attaching filter paper or medical gauze to a vacuum cleaner nozzle and running it for half an hour. You can also measure the dust on an air-conditioning, heating system, or air-purifying filter. A high measurement from concentrated air particulates is an indication of the presence of radon. Keep in mind that since the radon daughters are concentrated, high readings are not unusual if any radon gas is present. Our instruments measure ionizing, or nuclear, radiation. Radiation from microwave ovens, cellular phones, power lines, and electric appliances is non-ionizing electromagnetic radiation, which our instruments do not detect. Accurate measurement of radiation in food requires a multi-channel analyzer and a special oven for ashing the food to concentrate the radioactivity. Our instruments have been used for experimental, educational, and screening purposes in checking food. Measuring radiation in food is tricky. Naturally occurring radiation in potassium-rich food (such as bananas, when dried into banana chips, and salt substitutes) from Potassium 40 can easily be detected with the IMI Inspector Alert™ V2 and (with less sensitivity) the Radalert® 100X. In the case of fallout from nuclear testing or accidents (such as Chernobyl), you would be looking mostly for Strontium 90, Cesium 137, and possibly Plutonium 239. Of our instruments, the IMI Inspector™ Alert is the best for this application because of its higher sensitivity. The IMI Inspector Alert™ efficiency for Sr-90 and Cs-137 beta is good, and it does detect the Cs-137 gamma. It does detect Pu-239, but Pu-239 can have health effects at very low concentrations, which can be difficult to detect with any instrument. Before you screen for radiation in food, you should establish a baseline measurement in the same location where you plan to test the food. It is best to accumulate the baseline counts for 12 hours as described below. When you measure, you should put the mica window of the instrument directly over the food you are measuring, as close as possible. In the case of milk or other liquids, fill a container very close to the top so you can measure directly, without the glass in the way. If all your milk is from the same source, you might want to boil or evaporate some to concentrate it, then take a measurement from that. Set the display to Total and accumulate the counts for 12 hours in each location. Divide the total count for the period by the exact number of minutes to get the average CPM. You need to know the efficiency of the detector for the particular radionuclide, then you need to determine the sampling time to obtain the (statistical) level of confidence that you want (for example, 2 sigma). You must also consider the detector geometry in relationship to the source; for example, if you are measuring on a flat surface, you detect only the radiation that decays in the direction of the detector; so, using a 1000 DPM point source with 100% detection efficiency, you would detect approximately 500 DPM. Using the Radalert® 100X or the IMI Inspector Alert™ in the Total mode (accumulated counts) greatly enhances the sensitivity by providing a longer sampling period. What is the difference between a combination device that has a base unit with different probes and an all-in-one device? Combination survey meters that have a base unit with an interchangeable GM probe and/or a scintillation probe are a bulky and expensive solution. An all-in-one device is lighter, easier to operate and less expensive. If you are a sophisticated user and you understand the differences in the probes and you know how to make the appropriate adjustments on the instrument to accommodate them then this may be an appropriate instrument. Should first responders purchase an instrument that has a sensor that only detects gamma radiation above a certain energy range (e.g. an energy compensated GM)? We feel it is important that the customer realizes the limitations of instruments that only detect gamma radiation above a certain energy level. We advise that you consider a rate meter that detects gamma between the energy ranges of 15 keV and 10 MeV and also detects alpha, beta and X-radiation. It is important for a first responder to be able to detect alpha, beta and low energy gamma radiation in addition to high energy gamma radiation because there are many radionuclides that only emit alpha, beta or low energy gamma radiation. If a first responder has an instrument that only detects high energy gamma radiation, that person would not be aware of many possible dangerous radionuclides that could be used for a dirty bomb. For example, Americium 241 mostly emits alpha radiation as well as a little bit of low energy gamma radiation. Americium 241 is found in household smoke detectors and many industrial devices, and this radionuclide could easily be gathered in quantities large enough to make a dirty bomb. In fact, a few years ago, a boy scout gathered enough Americium 241 for a science experiment to endanger his entire neighborhood. Strontium 90 emits only beta radiation. Strontium 90 is a byproduct of nuclear reactors and is found in reactor waste. This radionuclide could also be obtained relatively easily for use in a dirty bomb. Plutonium 239 emits alpha radiation and very little gamma radiation. Plutonium 239 is regarded as highly dangerous and is considered a nuclear weapons material. Additionally, alpha and beta radiation are significant health risks if they are inhaled or ingested. Any of these three radionuclides and a host of others would be impossible or very difficult to detect with a gamma only detector. Should first responders purchase a dosimeter or a rate meter? It is important that first responders are equipped with rate meters instead of dosimeters because a rate meter immediately alerts the user to the presence of radiation above the normal background level. A dosimeter alerts the wearer to the fact that the wearer has absorbed a certain predetermined level of radiation. However, it could take the wearer a while to absorb this level of radiation, so the wearer would not be alerted immediately when he/she was in a radiation field. If a first responder was trying to determine if a package or bomb contained radioactive materials, a rate meter would be the appropriate device as it would immediately alert the user to the presence of radioactive materials. A dosimeter would not immediately alert the wearer to the presence of radioactive materials. Rate meters are perfect for users who do not know whether or not they are in the presence of excessive levels of nuclear radiation. A dosimeter is appropriate when the wearer knows that he/she is in a radiation field, but wants to get out before he/she has absorbed too much radiation. A person involved in a clean up situation after a dirty bomb would need a dosimeter, but a first responder responding to the scene of a bomb or a suspicious package would want a rate meter. Should a first responder purchase a neutron detector? Neutron radiation is very rare, and it basically only comes from Plutonium 239 which is a weapons-grade radionuclide, operating nuclear reactors and other uncommon isotopes. It would be highly unlikely to encounter neutron radiation, as this would most likely be in the event of a real nuclear bomb, not a dirty bomb. In the event of a nuclear bomb there would be all types of nuclear radiation present, not just neutron radiation. Neutron detectors are also quite expensive. Neutron detectors can be useful for detecting shielded sources of Plutonium 239. Is the size of the sensor important? The size of the sensor in a nuclear radiation detector is important. The larger the sensor, the more sensitive the device is in nuclear radiation detection. The larger the sensor, the more likely it is to come into contact with the nuclear radiation that is present. Should a first responder buy a device that does not have a user adjustable alarm? Many devices that have a factory pre-set alarm level have high settings in place that cannot be changed. Most first responders would want to be alerted to radiation levels at even low levels. Should a first responder purchase a device that has 1 to 10 level read-outs? Our devices have digital displays that tell the user exactly how much nuclear radiation is being detected at any given moment. 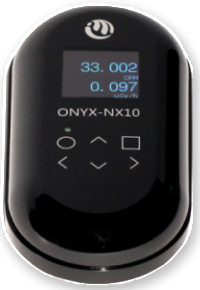 A product that has a display of numbers 1 through 10 does not actually tell the user what the level of nuclear radiation is.